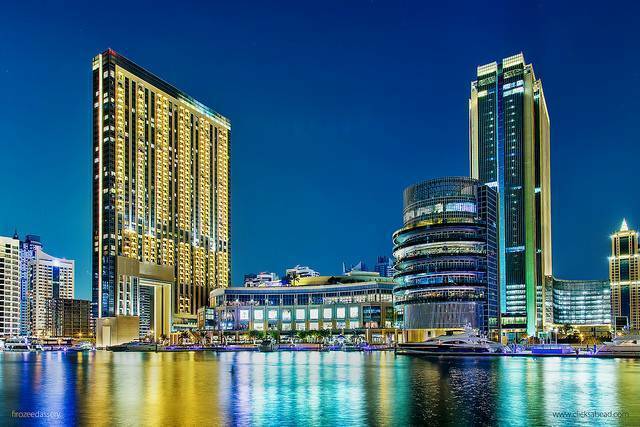 Located right in the heart of Marina, the Dubai Marina Mall is one of the malls in Dubai. It is a modern and stylishly built shopping and lifestyle destination which has a lot to offer both to the residents of Marina, as well as, the visitors coming from outside. This mall is spread across four levels and has around 130 outlets which range from high end fashion brands to the restaurants and recreational activities. The Dubai Marina Mall features fashion brands, boutiques, waterfront dining, super market and an entertainment centre. The mall is stylishly designed which makes shopping and spending time here a less tiring task. There are 2,000 undercover car parking spaces which reduces the hassle of car parking to a great extent. There is also a food court and the Njoi game zone which is quite fun, especially for the kids. The Marina Mall is impeccably clean and you can find many restaurants here, some of them overlooking the Marina which makes a good place to just hang out. Whether you want to shop, take your kids out for some fun or just chill with your friends, the Dubai Marina Mall has a lot to offer.